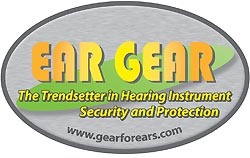 Ear Gear protects the delicate electronics of behind-the-ear hearing instruments from sweat, moisture, dust, dirt and shock. The unique nylon/Spandex blend is comfortable to wear, reduces chafing and is acoustically transparent, so it won't interfere with hearing aid performance. 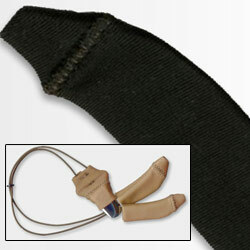 The corded model clips to clothing, providing added protection from loss. Ideal for children and for those with active lifestyles, including hikers, runners, bikers, golfers. Comes in assorted colors and styles, including models for hearing aids, hearing aids with FM attachments and cochlear implants. 1-yr manufacturer's guarantee.